This Adams was not the 6th president of the United States who lived from 1767-1848. This Adams was a Baptist pastor from New Jersey who lived from 1825-1881. This little book was first published by the author in 1876 and reprinted by Backus Book Publishers in 1980. Adams first preached these messages to his church and then was encouraged to put them into print. 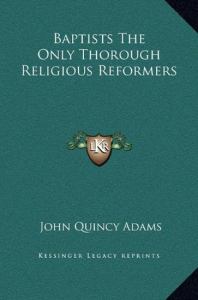 Adams sought to reestablish historic Baptist principles especially having to do with believer’s baptism, the New Testament order of local churches, and the right of individual conscience in matters of faith. He also includes a message on the “correct principle of Biblical translation” in which he defends Baptist missionaries in translating baptizo with the word for “immerse” in the language of their country rather than “transferring” it by simply spelling the Greek word.